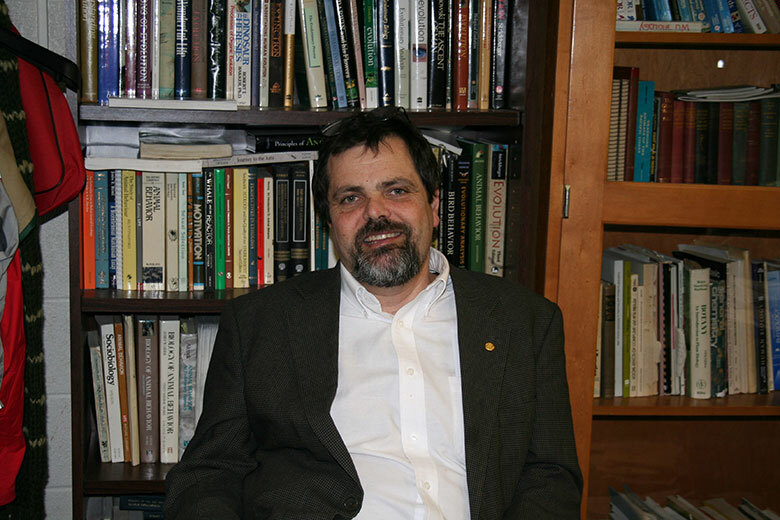 Michael Steele, professor and chair of the biology department at Wilkes University, recently was featured on New Hampshire public radio show. Michael Steele, professor and chair of the biology department at Wilkes University, recently was featured on New Hampshire public radio show in a segment called “Ask Sam.” The anchor, Sam Evans-Brown, tracks down answers to questions about the environment and outdoors. A listener asked Brown, “Do squirrels swim or is it a sign of the apocalypse?” So, the radio host came to Steele for his expertise on the subject. Steele’s research interests include foraging behavior, seed predation, and seed dispersal— all subjects that pertain to the listener’s question. Steele explained that the reason a listener saw a squirrel jump in river for a quick dip was because last year was a “mast year” for local oak trees, meaning there were more acorns than usual in the forest. More acorns, more squirrels: simple. He explained that since there was an overabundance of food for squirrels, many squirrel families had two litters instead of the usual one. Squirrels begin swimming because they are hungry. Since there are more of them in a high-mast year, the animals are willing to take any risk to feed their family – even crossing rivers and swimming to shore. You can hear Steele explain the squirrel apocalypse at http://www.nhpr.org/post/ask-sam-i-saw-squirrel-swimming-was-it-sign-apocalypse#stream/0.